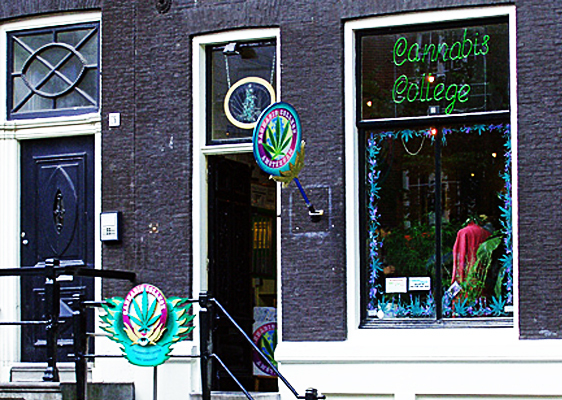 Opening in 1998 with bare brick walls with only newspaper cuttings, it is safe to say the Cannabis College has come a long way. To celebrate the success of both the College and its unique feature – the garden – the College has made some big changes. The original College burned down in 2002, meaning a full renovation of the College had to take place. Luckily, the garden was only hit by minor smoke damage and meaning that many of the what was once 100 plants had survived. At the Cannabis College you can gain expert knowledge on safe recreational Cannabis and also receive an education on about the multiple uses of the hemp plant. A guide will take you on a tour of the Cannabis College and also their garden where they are able to illustrate to you their information with a bio-organic example of what indoor growing looks like. It also features a photo display installation that illustrates the main stages of Cannabis development. The main focus of the Cannabis College is to educate the public about safe Cannabis and help banish misinformed and unintelligent arguments in the changing era of the drug laws. The Cannabis College is always at annual Cannabis and hemp expositions, festivals, competitions and demonstrations.